In 1290, Scotland was in crisis. King Alexander III had passed away unexpectedly after falling off his horse and had no surviving children. His wife, Queen Yolande, was pregnant but miscarried after his death. Finally, his last legitimate heir, his seven-year-old granddaughter Margaret, died of illness while traveling from Norway to Scotland to be crowned. The kingdom was thrown into chaos as 14 pretenders to the throne staked their claim. 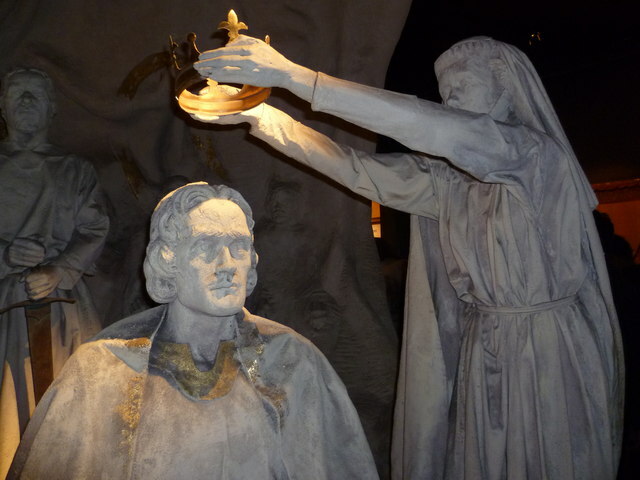 As the pretenders maneuvered to secure support, Robert Bruce (grandfather of the later king) and John Balliol emerged as the two leading choices. The Guardians of Scotland – a group of leading Scottish nobility – felt that a civil war would result if a foreign mediator did not intervene. 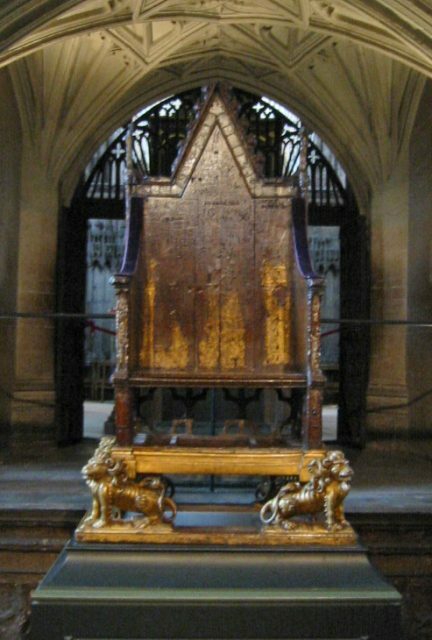 They decided to call upon the English king, Edward I known as “Longshanks” to help them decide their next ruler. Edward convinced all of the claimants except for Bruce and Balliol to back down. 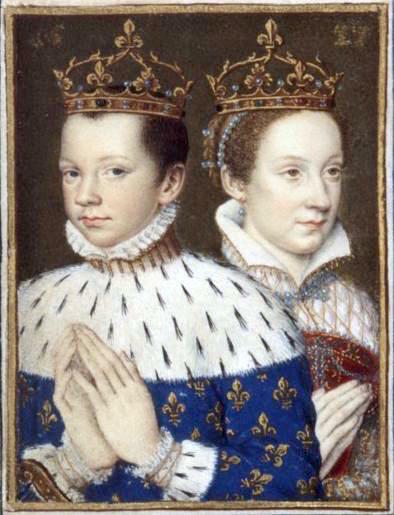 Those two were each allowed to pick 40 loyal men out of 104 on a council that would vote for the next king. Edward selected the remaining 24. This essentially made Edward the tiebreaker. At that time, the English used the primogeniture system to determine an heir whereas the Scottish used the tanistry system. Primogeniture is where the first born legitimate son or heir is chosen to rule. In contrast, tanistry is essentially a type of elective monarchy where the most important political leaders gather to vote for a member of the ruling dynasty to become the next king. Unlike Primogeniture, this candidate did not have to be the oldest or even a direct descendant of the previous monarch. Bruce argued that he should under both the tanistry system and proximity of blood. Baliol argued his claim under the rules of primogeniture. 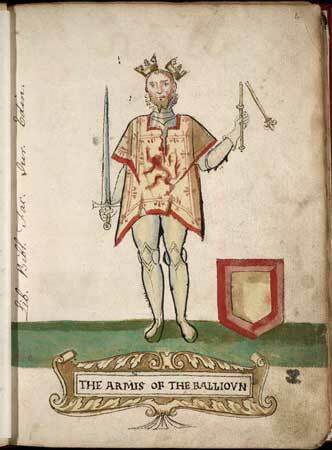 Since Edward was the tie-breaker and he preferred primogeniture, John Balliol was crowned King of Scotland. The implications of this whole affair were incredibly significant when it came to the relationship between England and Scotland. Not only had the English King been able to essentially appoint the Scottish king, but he had also extracted concessions from many Scottish rulers in exchange for his intervention. English kings had long claimed overlordship in regards to Scotland. Edward demanded that the Guardians of Scotland recognize that Scotland was England’s vassal. Although they refused publicly, many of the Guardians and nobles privately gave in. 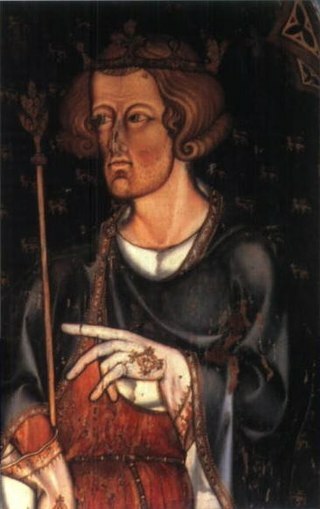 Edward flexed his power by demanding that Balliol pay him homage and recognize his authority over disputes between the Scottish King and his subjects. Edward went out of his way to humiliate Balliol, repeatedly calling him to appear in the English courts as a plaintiff in unimportant matters, just to prove that he could. Edward also demanded that the Scottish prepare to offer England military support in an upcoming war against France. Scottish nobles knew something had to change, or else it would only be a matter of time until Scotland was truly an English vassal. France had a long history of fighting the English, and Balliol’s family had French ties. Although a council of nobles stripped Balliol of his power, they formed an alliance with France, and Balliol publicly denounced his homage to Edward. Edward’s retribution was swift and devastating. English forces soon crossed the border and sacked the town of Berwick. It could hardly be called a battle – the Scottish garrison surrendered quickly, while the English killed between 4,000 and 17,000 civilians. Edward then sent one of his finest commanders, John de Warenne, to crush the Scottish forces at the Battle of Dunbar. The Scots probably lost the majority of their cavalry in this one battle. Since the cavalry was frequently composed of nobles, about 100 Scottish lords, knights, and men-at-arms ended up taken prisoner. With many of his realm’s leaders captured, King Balliol surrendered. All seemed lost for Scotland when William Wallace and Andrew de Moray rose in rebellion only a year later. Wallace joined a growing rebellion when he rose up and killed the Sheriff of Lanark. Wallace’s finest moment came at the Battle of Stirling Bridge. Sensing an opportunity, Wallace set up his troops on one side of the bridge and waited for the English vanguard to cross. As the English army crossed, the Scots launched their attack, catching the divided English army unprepared. When more English attempted to cross over to reinforce the other part of their army, the bridge collapsed. As a melee ensued, the English left on the other side of the river could only watch the slaughter since their archers would hit their own men if they loosed. Although Wallace was made the Guardian of Scotland as a reward for his victory, his success did not last. Edward’s next invasion culminated in the Battle of Falkirk. The Scottish forces at Falkirk consisted mostly of spearmen in the famous Scottish schiltron formation. However, the Scottish cavalry and archers were decimated by the English heavy cavalry, leaving the spearmen alone. English longbowmen loosed their arrows, and the Scots had no way to fight back. The war dragged on and went back-and-forth. The Scots won a significant victory at Roslin, but France soon dropped out of the war, allowing Edward to unite his forces. 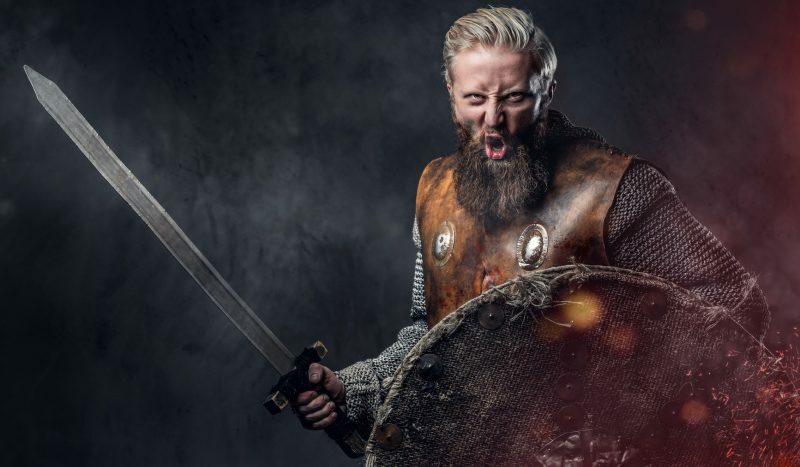 When Edward invaded Scotland again in 1303, the Scots did not have enough forces to face him in open battle, so Wallace attempted to delay and harass him when possible. However, the lowlands were captured, one city after another, by the English armies. In 1304, most of the Scottish nobles surrendered. Only Wallace and a few of his loyal followers kept fighting until Wallace was captured and executed. However, Robert the Bruce, a claimant to the Scottish throne, was not ready to give up yet. Despite publicly declaring loyalty to England, Robert had actually formed secret alliances with several Scottish noblemen to prepare for another rebellion. One of those “allies,” John “Red” Comyn, betrayed Robert by informing Edward of his plans. However, Robert managed to escape capture after being tipped off about an hour before Edward’s men arrived to arrest him. Back in Scotland, Robert called a meeting with John Comyn in a church. Accounts vary as to what occurred, but in all versions, at the end of the meeting, John Comyn was dead. Some say that Robert injured Comyn before his men finished Comyn off, while others say that Robert’s men killed Comyn without Robert himself injuring him. Regardless, it was too late to go back, and Robert went with his allies to Scone, where Scottish monarchs had traditionally been crowned. 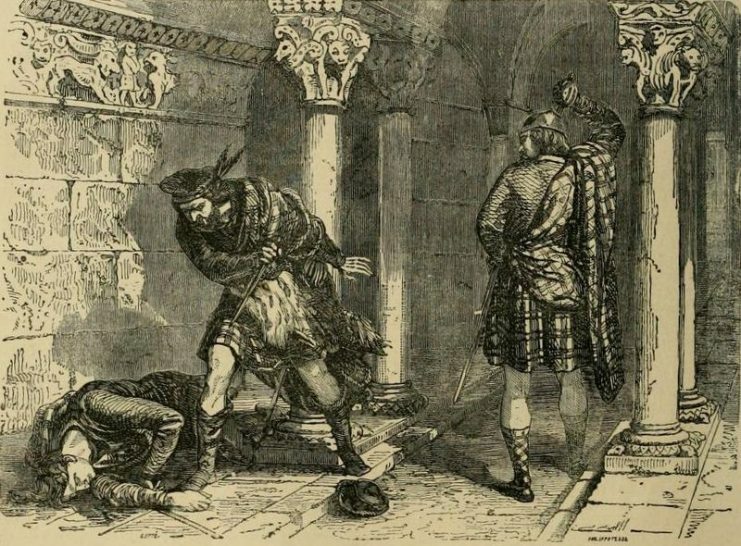 The killing of Comyn in the Greyfriars church in Dumfries, as portrayed by Felix Philippoteaux, a 19th-century illustrator. There was a question of whether Robert would be excommunicated for murder (committed in a church no less). However, it turned out that the Bishop of Glasgow, Robert Wishart, was a patriotic man. The bishop absolved Robert and endorsed his claim. 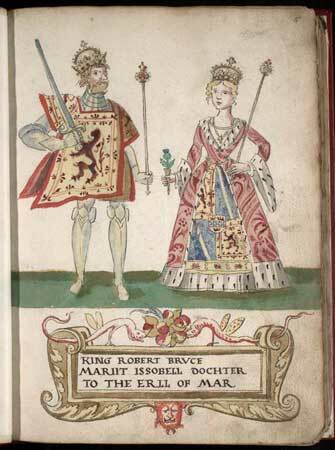 Robert was then crowned King Robert the First of Scotland. 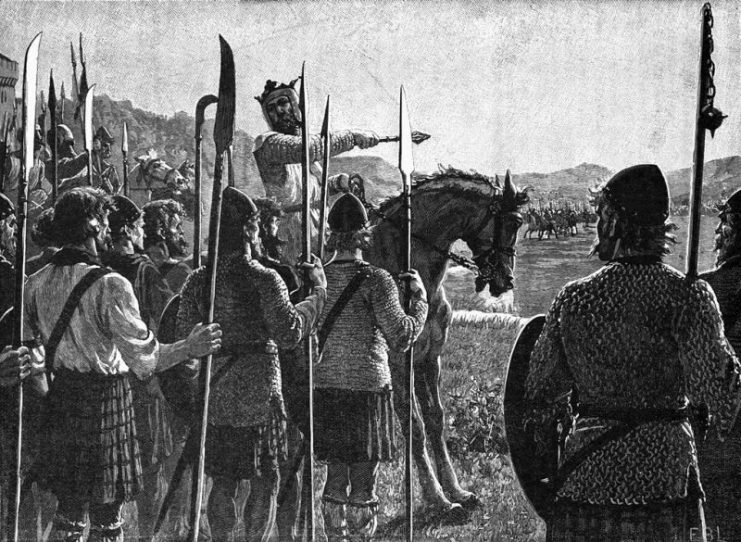 The new king gathered his men and marched into battle against the English at the Battle of Methven. Unfortunately for the new king, defeating the English was no easy task, and his army was crushed. The king and his few remaining followers retreated into the highlands. Robert’s misfortune continued as the murder of John Comyn combined with Robert’s decision to claim the throne started a civil war. Robert’s reeling army was defeated by an army led by Clan MacDougall, relatives of John Comyn. After gathering more support, Robert returned the next year. After two years of a brutal civil war, he came out on top in the conclusive Battle of the Pass of Brander. At the Pass of Brander, Robert’s forces successfully scaled a hill behind the MacDougall’s lines unobserved, and the subsequent rear flanking attack routed the MacDougalls. Robert then turned his attention back to the English. An early twentieth-century depiction of the Battle of the Pass of Brander. 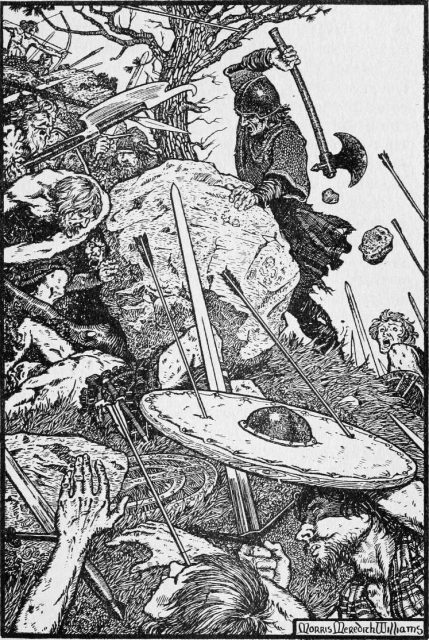 The original caption reads: “With Sword and Battle-axe fell upon the Men of Argyle”. Edward II attempted another invasion of Scotland in 1314 until he met Robert the Bruce’s force at Bannockburn. The fateful battle would last two days and has become one of the most celebrated events in Scottish history. The Scots began in a seemingly hopeless position, outnumbered several times over. However, fortunes changed as soon as the battle started. 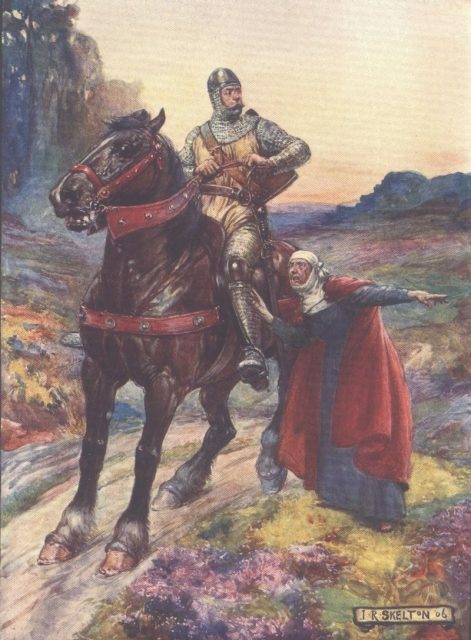 Robert Bruce led the army himself and was soon spotted by the English knight Sir Henry De Bohun. The King was only armed with a battle ax and was riding an unimpressive horse. 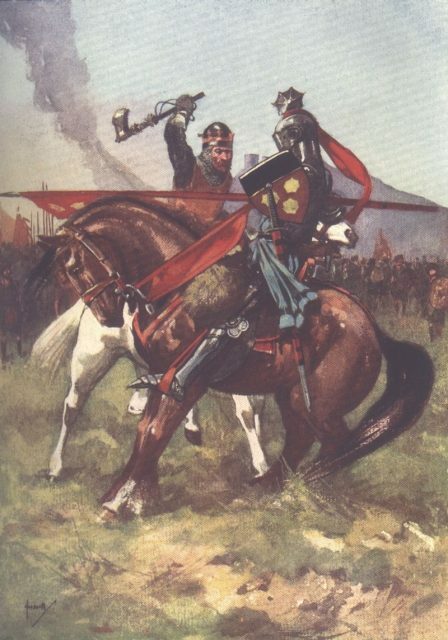 Sir De Bohun lowered his lance and charged directly for King Robert. However, at the last minute, Robert maneuvered to the side, stood in the saddle, raised his ax, and brought it down so hard that it split De Bohun’s entire helmet and head. 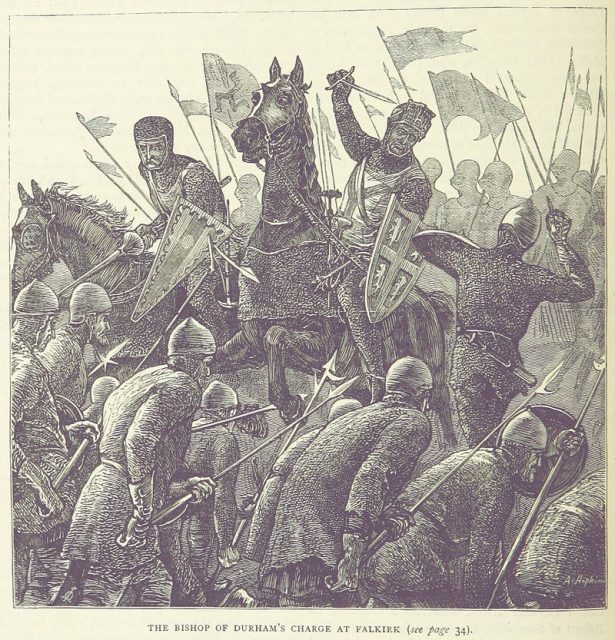 The Bruce killing de Bohun at the Battle of Bannockburn. This foreshadowed the rest of the battle. The Scots followed their king in the schiltron formation and routed the English infantry back across the Bannockburn river. On the other flank, Thomas Randolph (the Earl of Moray and Robert’s nephew) routed a second English force. The English retreated across the river as night fell and prepared for a second day of fighting. However, a Scottish knight who had sworn to serve Edward deserted and told the Scots where the English had made camp. Robert, encouraged by the news that his opponent’s morale was low, agreed to launch an attack in the morning. The English were caught off guard by the aggressive assault and struggled to organize themselves. 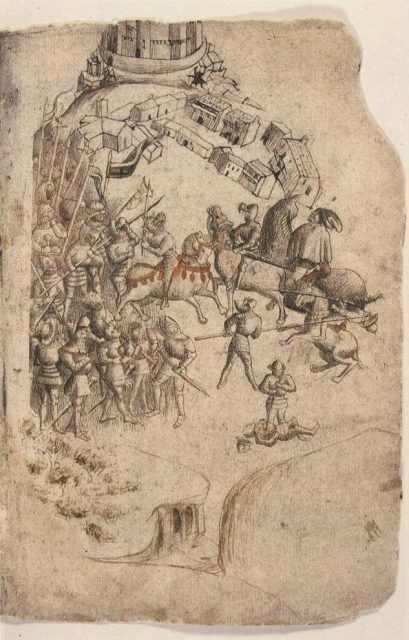 The English knights were stuck near the river and unable to maneuver as a melee ensued. English longbowmen had to stop loosing arrows since they were hitting as many of their own men as their enemies. Some longbowmen tried to flank the Scots but were forced to flee by Scottish cavalry. 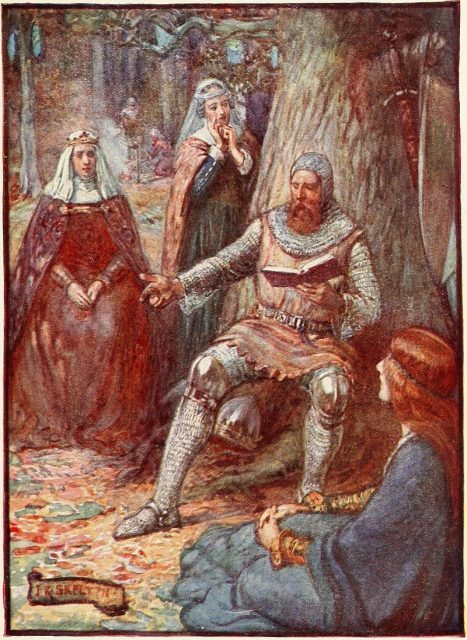 Bruce addresses his troops, from Cassell’s History of England. The English infantry could not stand against Bruce’s aggressive use of spearmen. The English army fled, and King Edward was nearly captured. Although this did not end the war, it marked a turning point that the English never recovered from. Although a Scottish campaign in Ireland failed, Bruce was determined to bring the fight to the English. He achieved a great symbolic victory by retaking the border town of Berwick which had been captured by the English in the first battle of the war. In 1319, the Scottish invaded England and won a great victory in the Battle of Myron. Bruce then launched the successful Great Raid of 1322 into Northern England. 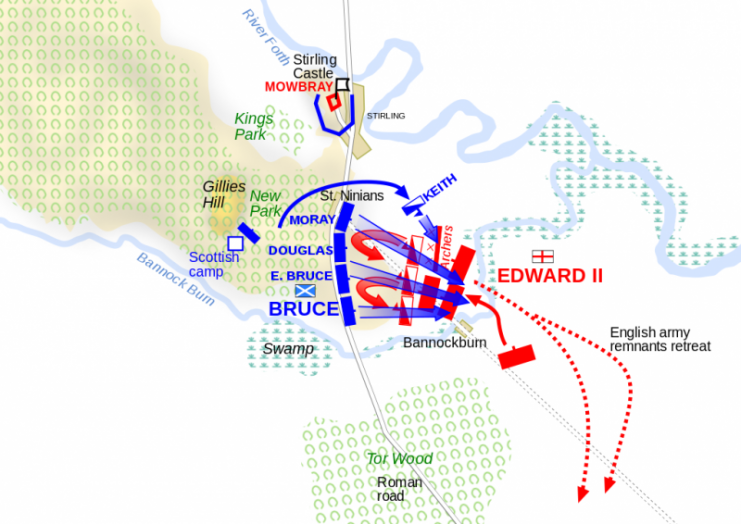 An interpretation of the battle of Bannockburn–second day. The war ended with the Battle of Stanhope Park, a Scottish victory in Northern England in 1327. 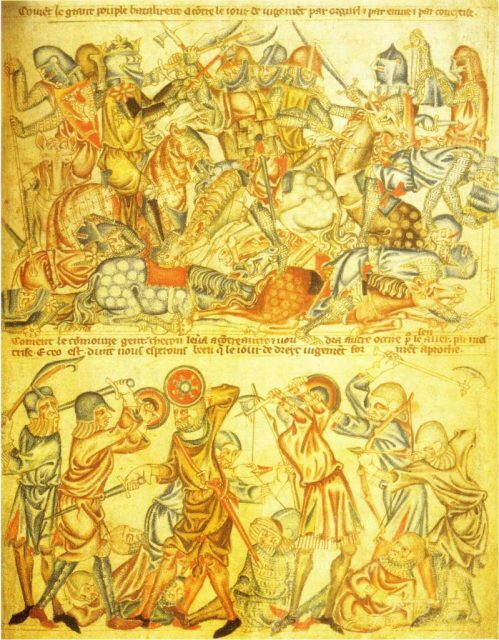 A Scottish night raid on the English camp routed Edward III’s troops. This was Edward III’s first campaign, and he had already nearly been captured. At this point, the English were economically depleted and demoralized. 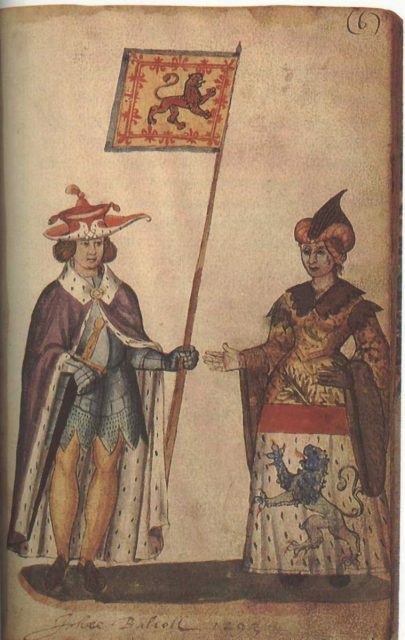 Both sides signed the Treaty of Edinburgh–Northampton which established that Scotland was independent and Robert the Bruce and his decedents were the rightful monarchs of Scotland. It also reestablished the pre-war border. The First Scottish War of Independence was a complex, back-and-forth conflict. Despite the fact that the English appeared to have definitively won several times, the incredibly determined Scots kept up their fight and ultimately snatched victory from the jaws of defeat.